What is Financial Management Tutorial? 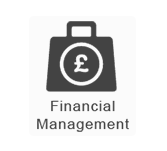 Financial Management deals with accounting, budgeting and charging activities for services. It procures all costs of any organization on the basis of direct and indirect costs. Usually this process includes three types of service providers – internal, external or shared service providers. This tutorial is targeted for Accounting and Finance students who wish to seek career in accounts and cost accounting. To learn this tutorial, one must have basic understanding of finance and accounting concepts, cost management and other accounting related concepts.